Employee engagement is a lot like a puzzle. It’s complex, has many parts to it, and they all need to fit together in order for you to see the bigger picture. You can’t simply have cool perks in your office with no underlying values or mission. Similarly, engagement won’t be complete if you have a meaningful mission without offering employees the right incentives to motivate them. The term “engagement” has been used so often and in so many different situations that it’s become hard to define. Many people think it means happiness or satisfaction, but you’ll soon understand that it’s much more than that. Millions of people are unhappy, unproductive, and not bringing their full value to your organization. As upsetting as this is, it can also be seen as an opportunity for organizations to go full throttle with employee engagement and completely outpace their competitors. No worries, just enter your email and you can save the PDF for later. Notice the common themes with all three of these definitions: emotional commitment and attachment from employees. When an employee is engaged, they’re “all-in” and genuinely want to see the organization succeed. They’re not just there for a paycheck or because they have to be, they really want to be there. Employees solve problems without you asking them to. They look for new solutions to processes and procedures. They innovate, collaborate, and inspire others around them. When an employee is engaged, they use discretionary effort to go above and beyond their normal job requirements without being asked to do so. They do this because they’re invested emotionally, and they genuinely care about the company. This all leads to happier customers, better business results, and a stronger employer brand. Employee engagement is the emotional commitment that an employee has to the organization. Imagine if every employee was passionate about seeing the company and its customers succeed. The only true way to ensure that your customers are well taken care of is by taking care of your employees. This is known as the service-profit chain 1, a concept first introduced by Harvard Business Review in 1998. It’s still as relevant today as it was then. The service-profit chain is the flow from the culture you create to the profits you generate and every step in between. The key is to start internally. When you create an environment where employees are happy, productive, autonomous, and passionate about what they do, they’ll provide better service to your customers. A stronger employer brand, helping you recruit and retain the best talent. Reduced stress at work, letting everyone be themselves and have fun. Psychological safety is so important. Lower employee turnover, helping you avoid the costs (time and money) of replacing someone. Increased productivity, because employees that are engaged collaborate better. According to the Bureau of Labor Statistics, “working and related activities” account for the biggest portion of our day with the average being 8.8 hours spent on it (second place is sleeping at 7.8 hours). When you think about how much of our time is spent at work (about 8 times more than “caring for others”) it’s only fair to hope that it can be pleasant. No one should have to spend that much of their life stressed, unhappy, overworked, or under-appreciated. As leaders, we need to do more for employees and ourselves, to ensure that we’re all living a happy, healthy, and productive life. Now that you understand what engagement means and why it matters, it’s time to dive into each piece of the engagement puzzle. Personal growth is the first piece of the puzzle, and arguably the most important. When an employee stops growing, they plateau, get bored, and will eventually start looking elsewhere for career opportunities. Research from Gallup found that 87% of millennials rate “professional or career growth and development opportunities” as important to them in a job. They also found that “opportunities to learn and grow” is one of the top three factors in retaining millennials, and is the only aspect of retention that separates millennials’ needs from those of non-millennials. Daniel Pink, in his book, Drive, talks about these three components as the things that truly motivate us to do our best work. We all have an inner drive that makes us curious to discover and learn new things. Our self-direction is a part of who we are. At work, we need to feel like we have control over our work and our day-to-day. This is so important for engagement, and companies should be actively looking for ways to give their employees more autonomy over their work – whether it’s deciding what to work on or when to do it. Mastery is the concept of getting better at something and the feeling we get from progress. This is easier said than done, because we can easily become overwhelmed if a task is too difficult. On the other hand, we become bored if a task is too easy. Pink recommends working on what he calls Goldilocks tasks8, tasks that are just right. In order for a task to be stimulating enough for you, it needs to challenge you and push you outside of your comfort zone, but, not too much. When a task is too challenging, performance declines. It’s important for leaders to have frequent, open discussions with their employees about the difficulty of their work, and find ways to support their learning and development. Purpose is when you connect with and believe in the mission and purpose of the organization. According to Pink, that is the highest level of motivation that you can achieve. It can’t be faked. If you’re truly passionate about what the organization is doing, you’ll come to work each day excited and motivated. Managers can help their employees achieve purpose by connecting their work to the bigger picture. Instead of focusing exclusively on numbers and metrics, highlight the real change you’re making in customers’ lives by giving them a voice. As an example, one study9 found that showing photos of patients to radiologists (who rarely get to see the patients) helped them improve their performance because they were able to appreciate their purpose more. Another example of an organization that does this well is Southwest Airlines (who have been profitable for 40 consecutive years). They’re incredibly focused on their people, their culture, and their customer service. Invest in learning. Give employees the opportunity to continuously grow and encourage them to learn. Promote autonomy by giving employees the space they need, and avoid micromanaging. Have (and promote) a clear mission that everyone can get behind. Make sure you’re doing everything you can to help employees achieve purpose. Feedback is another major piece of the puzzle. Employees need a clear understanding of their performance in the organization and whether or not their managers believe they’re doing good work. Any ambiguity will lead to confusion for the employee, and that’s not very helpful. The way feedback is handled in most organizations is completely broken10. Managers are scared to give feedback, they’re not trained on how to properly give it, and most employees are left in the dark. Often, employees have to wait until an annual review to get any sense of how they’re doing, but that’s way too long of a timeframe. As much as managers don’t enjoy giving feedback, you have to do it. Employees are craving it. In fact, research firm Zenger/Folkman found that employees would prefer receiving actionable tips on how to improve rather than approval or compliments. Feedback is a very delicate thing though, it’s tough to get right. Even the slightest mistake can make an employee shut down completely. The words you use, your tone of voice, and even your body language all have an effect on the way you give feedback. The research by Zenger/Folkman found that how the feedback was delivered affected whether an employee wanted corrective feedback or not. So then the question for managers becomes: how do we give better feedback? When a basketball player does something wrong, do you think the coach waits until the end of the season to tell them about it? Of course not. You can’t wait until the end of the year to give someone feedback, it’s already long forgotten about. Research shows that companies that implement regular feedback experience 14.9% lower turnover rates than companies that don’t implement regular feedback. Feedback is all about changing behaviours, so by giving feedback quickly after the behaviour you want changed, the more likely they are to change it. Give feedback in as near real-time as possible, and make sure to have frequent meetings (like one-on-ones) with your employees. The best way to ensure that feedback gets listened to is to tie it to a goal. That way, you can measure the employee’s progress for performance, and they can use that metric to measure their own personal growth. Without a specific outcome defined, it becomes hard to see what effect the feedback had. Feedback can be very sensitive for employees, so your job is to make it as neutral as possible. You don’t want your feedback to come off as a personal attack, so it’s better to focus on the behavior rather than the person. For example, instead of making your feedback about the person (“you’re always late!”), you can make it about the behavior (“when you showed up late, it slowed the whole team down…”). Have a continuous feedback process that includes things like one-on-ones, OKRs, 360 reviews, etc. Ask an employee permission to give them feedback. It will help make it easier for them to handle. Be honest and straightforward with your feedback instead of trying to hide it. The third piece of the engagement puzzle is employee recognition. Recognition is simply the acknowledgement of a job well done. Sounds simple in theory, but unfortunately, so many leaders get it wrong. These are both important points. Luckily, they’re both easy to solve. The first place for a leader to start, is by understanding the value of recognition. According to the book How Full Is Your Bucket, the number one reason people leave their jobs is that they don’t feel appreciated. Once you realize how valuable it is, the next step is to understand how simple it is. Leaders often make the mistake of confusing recognition with rewards. They have nothing to do with each other. As mentioned earlier, recognition is simply the acknowledgment of a job well done. As a leader, take a step back and be more mindful of what your employees are doing, and just tell them that you notice it. One of the most frustrating things for an employee to go through is to not get recognition when they feel like they deserve it. How Often Should You Recognize Employees? According to Gallup, you should be recognizing employees at least once a week, at the bare minimum. Longer than that, and dopamine levels of an employee start to go down and they can become more demotivated. Our research, after analyzing 1,000,000 employee survey answers, found that 65% of employees feel like they don’t get enough praise. Recognition is one of the simplest and fastest ways to increase employee motivation. At the beginning of your next meeting, take time at the beginning to highlight someone publicly. Post a public message in Slack, email or any other communication tool you use. Do something personal (like a handwritten card) to show that you’re going the extra mile. No problem! All you have to do is enter your email address and we'll send you the full PDF of this guide for free. The employee-manager relationship is so crucial when you think about how much a manager can affect an employee’s life. Managers can fire employees, assign them work, affect their promotions, approve time off, etc. Think about how scary that relationship must be from an employee’s point of view. Most employees must be in a constant state of fear, trying desperately to impress their manager. That’s why, according to Gallup, managers account for 70% of the variance in employee satisfaction scores. When you think about how much of an effect a manager can have on an employee, it starts to make sense. The “Relationship With Manager” piece of the puzzle is a very crucial piece, as most people leave companies because of their boss. In one of Gallup’s research reports, State of the American Manager: Analytics and Advice for Leaders, they asked employees to rate their managers on specific behaviours that are linked to employee happiness. They recommend leaders to communicate with their team frequently, and create a safe and open environment for employees. Everyone should be comfortable enough to approach their leaders with any concerns they have. Performance management should be done frequently, and leaders that only use annual reviews are missing out on an opportunity to develop their employees. They also say that too many managers focus on weaknesses. If you focus on helping an employee recognize and develop their strengths, you’ll have a much more engaged and productive workforce. Want to step up your leadership skills? Take this free 11-day email course. Collect feedback form your employees. That vulnerability and growth mindset will show employees you’re trying to improve. 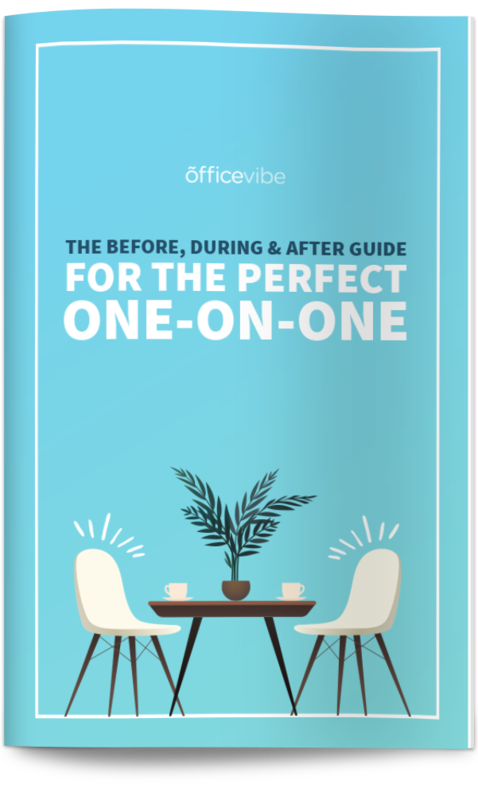 Use your one-on-ones as a way to connect with employees on a personal level. Organize (and attend) informal gatherings like happy hours or team lunches. You likely spend more time with your coworkers than you do with your friends, spouse, or family, so it’s important that you have good relationships with them. Organizations should be doing everything they can to foster friendships at work, and creating those connections is easier than you might think. Something as simple as a happy hour or a team lunch can have a huge impact on those bonds at work. A study in the Journal of Personality and Social Psychology12 wanted to look at the effects of friendships at work on team performance. The researchers divided up the participants into groups of three, consisting of either three friends or three acquaintances, and assigned them projects to work on. The groups of friends performed better on every project because they communicated better, were more honest with each other, and were more committed to the team. The groups of acquaintances tended to work alone, didn’t offer each other feedback, and weren’t comfortable enough to ask for help. This is a valuable lesson for all leaders. Make sure that everyone on the team is friends with each other, and that no one feels left out. That feeling of isolation or being ignored is even worse for you than being bullied. Social events are a great way to form those bonds, and don’t need to be very formal. Encourage group projects and create time for employees to work together. Team lunches are a nice way to get everyone together, especially the shy ones. Happiness is a key part of employee engagement, but it’s worth noting that it’s only one piece of the puzzle. Many people make the mistake of thinking that employee engagement and employee happiness are the same thing – they’re not. This quote from Kevin Kruse is an important distinction between engagement and happiness. You can be happy at work without being fully engaged, if, for example, there are no opportunities for growth or not enough feedback being given. Remember, happy workers are busy workers. Researchers have found that happy employees are 12% more productive. As a leader, you want to be doing everything you can do make your employees happier. You don’t need to do it alone though. Many of the ways employees will find happiness is through their own efforts, like meditation, exercise, practicing gratitude, etc. All you need to do is encourage these activities and make it easier for them to do (like subsidizing a gym membership). Encourage fun in the workplace. Be a good role model and create a relaxed environment. Be flexible with your team. Tell them not to worry about working from home or taking time off as long as they reach their goals. Focus on small wins, and continuously remind the team of the good things they’re doing. Are the employees in your organization ambassadors of your brand? If there was a job opening and they knew someone that would be a good fit, would they recommend it to them? These are interesting questions to ask yourself, and ambassadorship is a very important piece of the puzzle. Attracting and retaining employees is getting harder than ever. Organizations have to work twice as hard now to create and maintain a meaningful employer brand. The best way for an organization to promote a powerful employer brand is by starting from inside their organization and improving the company culture. One of the most popular ways to measure whether your employees are ambassadors or not is by using the Net Promoter score (eNPS), a concept originally developed by Bain & Co. as a way to measure customer loyalty. The way it works, is you ask employees “on a scale from 0-10, how likely are you to recommend this organization as a good place to work?” and then follow up with a “why?” It’s the qualitative responses (the why) that give you the most value. You’ll be able to see exactly where the issues are in your culture. Want to learn more about how eNPS works? Check this free guide to learn how to calculate your score, how to improve your score, and what to do with your results. The goal is to continuously work on improving your organization’s score, and have an organization full of ambassadors, spreading the message of your mission for you. It’s like amplifying your recruiting team by 10,20, or 100. Measure eNPS and obsess over that metric. Find out why people would hesitate to promote your brand. Do things like stay interviews or focus groups to get feedback. Involve employees as much as possible in defining how to improve your employer brand. This is a piece of the puzzle that unfortunately often gets forgotten, but is such an integral part of employee engagement. When employees have a good work-life balance, they’re much more productive. 60% of employees worldwide notice their job taking a tole on their personal life. Employees need work-life balance in order to stay productive and engaged. Many organizations have unrealistic expectations of what their employees can and should be doing. It’s unfair to assume that employees will always be available for you and to not even consider their lives outside of work. Everyone needs time to recharge and refuel, and as leaders, we need to be more mindful of that. Employees all across the globe are stressed, overworked, under-appreciated, and are having a tough time managing their wellness. Mental wellness isn’t talked about enough, and physical wellness is often treated as an afterthought. When you offer perks like fruit in the kitchen or subsidized gym memberships, it makes life easier for employees, and shows them that you genuinely care about them. The costs can be minimal, but the return on investment can be huge. You’ll have happy, healthy, and productive employees. Have fresh fruit in the kitchen. It’s one of the least expensive and most appreciated perks. Subsidize gym memberships or other sporting activities to help employees exercise. Promote mindfulness and a calm workplace, to reduce as much stress as possible. Many organizations look at culture fit during the hiring process, but what they should be focusing on is value fit. For an employee to feel connected to the organization, their personal values need to align well with the organization’s values. The key to making this process work for you is to be honest about your values. When creating your core values, you need to write things that you actually believe in and that you will use to run your organization. This all starts with having a meaningful mission that employees can get behind. Then, make sure everyone in the organization is spreading that message as much as possible. You want employees to be continuously connecting with that mission. The best path to success for your organization is when everyone is working together towards a common goal. Try to incorporate your core values into different areas of your organization, like through your performance reviews or team recognition. The more you can tie the behaviors they do to core values, the more likely they are to live those values each day. Use events like Town Halls as a way to update everyone on what’s going on inside the organization. Promote your core values as much as possible. Put them on the wall if you need to, but find a way to repeat them. Use employee onboarding as a way to really enforce the mission, values, and purpose of your brand. For an employee to be satisfied at work, there two key elements you need to think about. When it comes to compensation, remember that money isn’t the only thing that motivates people at work. Once salary is off the table, the way you can make a real difference is through benefits. People want work-life balance and the ability to work remotely some days. As leaders, we all need to be more mindful of this. Make them feel comfortable at work. There’s so much fear that exists in most cultures. Your job as a leader is to remove this fear in order to keep them satisfied in a psychologically sound environment. Job roles and expectations need to be made clear. Set goals with your employees to make sure you’re both on the same page, and then measure success based on the goals. Too often, work is measured by time spent at an office desk, but it should be measured by looking at the results (that’s why it’s so important to set goals). You should be continuously looking for ways to improve this (hint: ask your employees) to make sure employees stay satisfied. Make sure employees are clear on their job roles. Any confusion will lead to dissatisfaction. In addition to a fair salary, make sure to offer good benefits like flexible schedules. Listen to employees. Ask for their feedback regularly and make sure they have what they need to do good work. The first step to measuring and improving engagement is to use surveys. You need a baseline to understand where you are and where you need to improve. When creating your survey, there are a few things you need to keep in mind. Survey fatigue is a very real thing, and the longer your survey is, the more chance you have of your data being incomplete or biased. Take the time to ensure that you’re only asking what matters. Creating survey questions is tough. You need to understand how to phrase your questions, which words to use/not use, and how to order the questions. If you want to learn more about how to do this properly, click here. Before even starting with surveys, make sure you’re in the right frame of mind. There’s nothing worse than asking employees for their feedback and not acting on it. You need to be grateful for their feedback, open to hearing anything (including negative comments), and ready to act. It’s important to note that measuring is only the first step. Like we mentioned at the beginning of this guide, managers have the biggest effect on employee engagement, so it’s really their responsibility to improve themselves for their employees. Training in emotional intelligence is a great place for managers to start, because a lot of those soft skills to be a better leader come from being more emotionally intelligent. Of course, make sure to hold managers accountable by setting clear goals for how they will improve. If the entire organization is committed to improving engagement, helping managers become better and more compassionate leaders is where you should focus your attention. Another important area of focus is on personal and professional growth. Of all of the pieces of the puzzle, that one is arguably the most important, because it’s what really appeals to employees at the root of their satisfaction. Make sure that employees have clear goals set for them, and that they have opportunities for advancement. 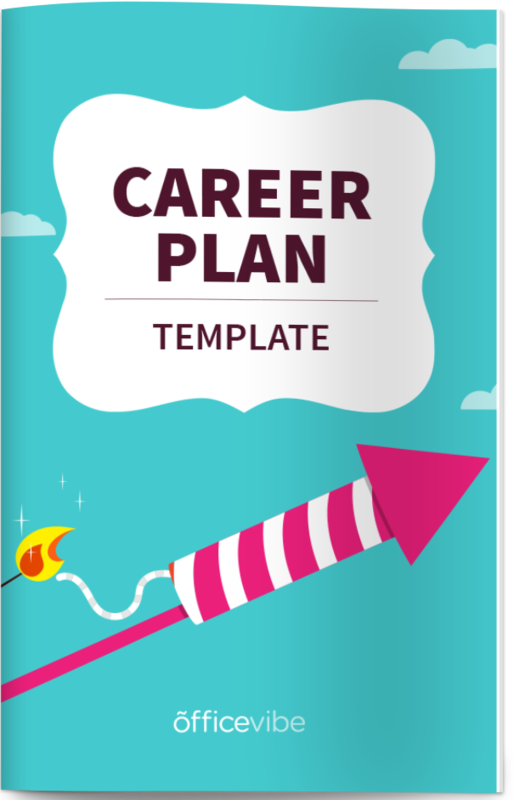 Free Helpful Resource: Get this career plan template to help your employees grow in the organization. At the root of all of this is trust and respect. Without that genuine respect, you won’t be able to truly connect with your employees and improve employee engagement. Here are a few ideas you can use right now to start engaging your team. People spend way too much time at work for it to be bland and serious all the time. While work and being productive is important, make time for social interactions and a bit of fun. It can be something simple like a team lunch out a restaurant every once in a while, but things like that help to build team spirit. As a leader, one of the best things you can do for your employees is to be flexible with them. Letting them work from home some days or encouraging them not to stay too late at work is important for creating a healthy and sustainable workplace. Don’t look at how much time an employee spends at their desk as a measure of productivity. It’s not. There are two important points here. You need to set clear goals, and they need to be realistic. Too often, teams set unrealistic goals that lead to unnecessary stress. For the overall health and wellbeing of your team, be realistic about your expectations. Encourage employees to speak up if they feel like they’re overworked. It’s also important to make sure that the goals are clear for employees. Don’t be shy to check in with them every once in a while to make things clearer. Want more ideas for how to engage your team? 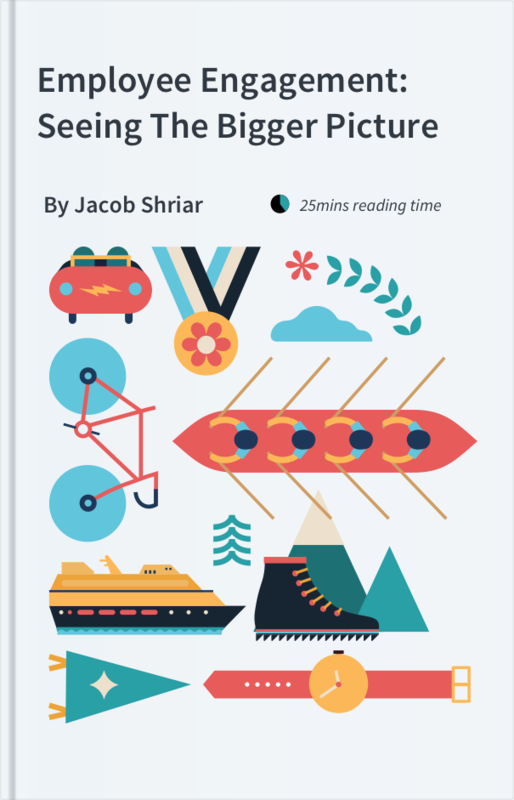 Check out this article with tons of employee engagement ideas. Don’t be overwhelmed. Start small, and scale up from there once you’re able to prove it works. Improving takes time, so be patient, and the more you involve employees, the better. The more involved they are in defining that strategy, the more likely it is to work. They’ll take it more seriously and be more emotionally invested in it because they had a part in creating it. Including employees in the creation of the strategy also takes a lot of the load off of your back, making it easier to get started. Ideally, you want to have an engagement strategy defined with many members of your organization that includes the 10 puzzle pieces we went through in this guide. Over time, you’ll create a culture of happy, healthy, and productive employees that are all working together to bring the organization to new heights. Officevibe is the simplest and most powerful employee engagement software that helps you collect anonymous feedback from your team. Start engaging your employees now. 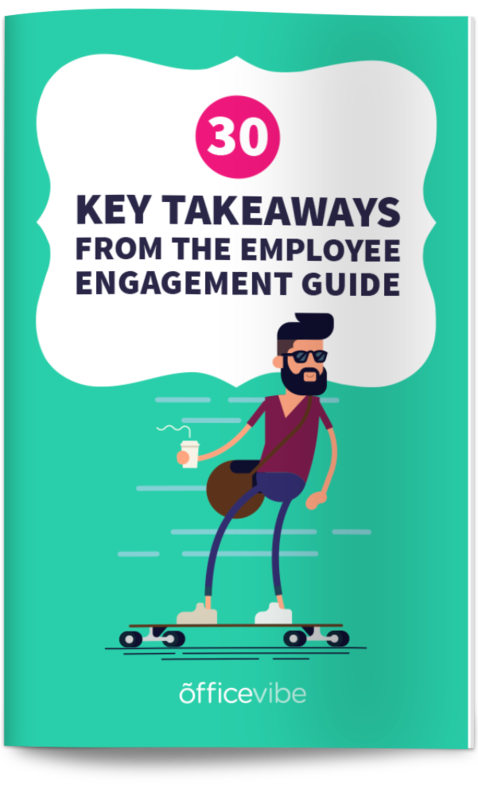 Free Helpful Resource: Get the 30 key takeaways from this guide to get started quickly with engagement.